Not entirely convinced you need a mentor? It’s one of those relationships you don’t realize how valuable it is until you have one. Here’s a sneak peek of the magic it’ll add to your professional life. 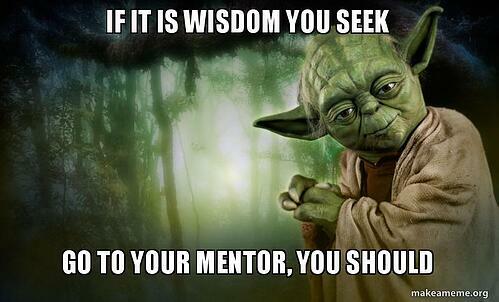 A mentor is not like any other relationship in your life. Your friends and family probably aren’t experts in your chosen field and are likely to tell you what you want to hear. A mentor is more likely to give you honest feedback focused solely on your professional development. Leave the personal dilemmas to your friends and family. A mentor can identify professional gaps. The great thing about a mentor is they probably once were in the exact same place you are. They’ve been in your shoes trying to figure out their career and know what they would have done differently. They can identify gaps in your knowledge you didn’t know existed and point you in the right direction to close them. A mentor can help you meet career goals. People love helping people. A mentor is the one person in your life solely dedicated to creating the best version of your professional self. A mentor can open doors you didn’t know were closed. There’s a whole professional world out there! There are networking opportunities, possible jobs, and new ideas waiting to be uncovered. Instead of having to sort through everything yourself, a mentor can cherry-pick the right ones for you. Your Current Circle: Your mentor might already be in your existing professional circle and you don’t even know it. Take a look at your current company, connections, and professors. Is there anyone that you've been wanting to learn more about and what's behind their success? Professional Associations: Research if your industry has a professional association in your city. If they do, they probably host events ideal for meeting possible mentors and might even have their own mentoring program. Alumni Networks: Reach out to your school’s job center about connecting you with an alumnus or review the alumni directory for someone that meets your criteria. They’re more likely to want to connect since you already have your alma mater in common! LinkedIn: Not finding your mentor in some of your existing circles? It’s time to turn to LinkedIn. Search for people in your desired role at different companies you admire. It’s always better to have someone you both know introduce you, but you can also try your luck at asking for a quick chat that may turn into something more. And ta-da, the spotlight is narrowed down on your perfect person! Next week, we’ll go over how to build the ideal mentoring relationship. Get ready to start 2019 off right with mentorship!